Biogas, more than all other renewables, has multiple positive outcomes that affect the entire system that surrounds and interacts with the biogas plant. Biogas is a mixture of methane gas and carbon dioxide produced from the fermentation of organic substrates in absence of oxygen, known as anaerobic digestion process. When this technology is included in the production cycle of a company, agricultural, zootechnical, industrial or agro-industrial, it increases the company’s economic and environmental sustainability of its production cycle. The use of zootechnical effluents reduces the emissions of methane and ammonia, the use of double culture reduces the leaching of nitrogen and nutrients in the underground and superficial water, the exploitment of the OMSW incentivizes correct waste division and treatment, reduces disposal costs and environmental impact. The production of natural fertilizers from the digestate of the anaerobic digestion reduces the environmental impact on soils, and, finally, the refinement of biogas in biomethane allows the use for transportation, reducing the quantities of fossil fuels. In a biogas plant the organic substrates most commonly used are agircultural leftovers, animal manure, slaughter house leftovers, energy crops, waste water, agro-industrial waste ad organic municipal waste. Sebigas has developed specific tecnologies that perfectly adapt to the characteristics of the substrates, exploiting the entire methane potential. 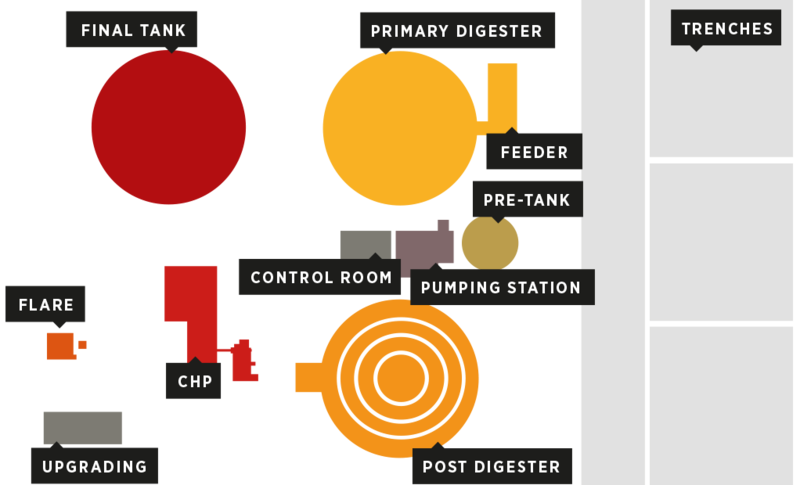 The technology chosen by SEBIGAS for anaerobic digestion is CSTR (Continuous-flow Stirred Tank Reactor), based on a semi-continuous flow of fresh biomass as input in the digesters at a controlled temperature and mixed, and an output called digestate. The output digestate can be spread on the fields as fertilizer, as it is or divided in solid and liquid fraction. Low autoconsumptions thanks to the optimization of the running time of mixers and pumps by the control system. In order to treat liquid substrates, SEBIGAS can offer a solution based on covered and gas-tight lagoons, temperature controlled. The technology is suitable for all organic liquid agro-industrial waste such as tapioca effluents, palm oil mill effluents (POME), sugar and ethanol processing waste. To convert the biogas produced into energy, SEBIGAS provides a complete cogeneration system in container, including a heat engine and an alternator. The system is also equipped with a heat recovery system for the production of thermal energy. In addition, to increase the energy efficiency of the plant, it is possible to recover energy from the exhaust gases through the installation of an ORC module (Organic Rankine Cycle). The produced biogas by the anaerobic digestion can be also treated in an upgrading system for the removal of CO2; the obtained biomethane at the end of the process is chemically very similar to natural gas and can then be injected into the network, used as motor fuel, for industrial uses or for high efficiency cogeneration. The principle on which this technology is based is the highest solubility of CO2 in water compared to methane. In this process, the raw biogas flows into a treatment column in countercurrent with a liquid flow. The column contains plastic material to increase the contact surface between the gaseous phase and the liquid phase. At the exit of the column, you will have a liquid phase enriched in CO2 and a gaseous phase mainly consisting of CH4. Beside the CO2, the process can remove H2S (hydrogen sulphide) e NH3 (ammonia). Chemical scrubbing is done with solutions of potassium carbonate. The CO2 is absorbed in the liquid phase and chemically reacts with the carbonate. Subsequently, the solvent linked to the CO2 is regenerated by heating. If H2S is also present in the raw biogas, it will be bind to the solvent and thereby you will need higher temperature for the regeneration. The electrical consumption is lower than other technologies thanks to the low pressures involved, however a heat consumption is need for regeneration. For the adsorption technology, porous materials are used, such as activated carbon, silica gel, alumina, MOF (Metal Organic Framework) and zeolites. In an adsorber, the gaseous by-products (CO2 and traces of other gases) are adsorbed while in another they are disadsorbed through an increase of temperature and a scrubber with inert gas. The phenomenon that regulates the separation of CO2 from methane is the pressure difference. CO2, O2, H2O e H2S are removed from the raw biogas by means of a selective permeation through a hollow fiber membrane. The main advantage of this technology is the easy management that increase the cost/benefit ratio. Moreover, it works at high pressures that limit the subsequent compression phase before the injection into the distribution network. SEBIGAS chooses the technology to be adopted according to the plant size, the degree of purity to be obtained and to the costs of CAPEX and OPEX.